BOISE, Idaho (KBOI) -- Hundreds protested dams on the lower Snake River in paddle boats claiming the dams consume taxpayer money and affect endangered salmon runs Saturday morning. 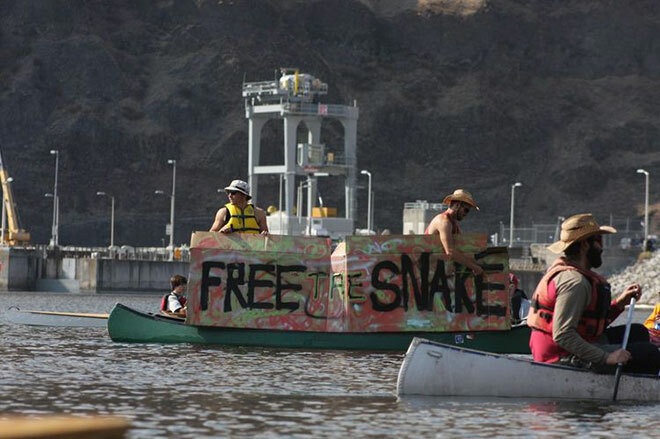 Officials say around 300 paddlers cheered "FREE THE SNAKE" to protest four dams. Paddlers included members and staff from Idaho Rivers United as well as Idaho citizens. "It's amazing to see citizens from throughout the Northwest and across America come together and give a voice to the lower Snake River, which has been silenced for nearly a generation," said Kevin Lewis, IRU conservation director. "Idaho's iconic wild salmon and steelhead need that voice to return to the abundance of the pre-dam era." IRU officials say people came from at least five western states to participate in the rally. The goal is to remove the four lower Snake River dams to restore endangered salmon runs leading to the survival of Puget Sound orcas, who eat salmon. Protesters say not only are endangered species at risk because of limited access, but tax-paying money is being spent on these "do-nothing" dams. "People came together today to give a voice to what is perhaps the greatest tragedy occurring right now in the United States regarding native species," said Brett Haverstick, education and outreach director for Friends of the Clearwater and one of the event's key organizers. "Today's actions are no doubt sending a ripple across the country and to the White House." The rally took place at Wawawai Landing on the north bank of Lower Granite Lake, which is three miles from Lower Granite Dam and upstream of the four lower Snake River reservoirs. Idaho salmon have been on the endangered species list for more than 20 years now. "It's time to free the Snake," Haverstick said.